So there a couple ways I attach the arms. The first and my favorite way to do the arms is what I call the “open” way, the second is what I call the “closed” way. The legs are done similarly, but I will do another tutorial for the legs. 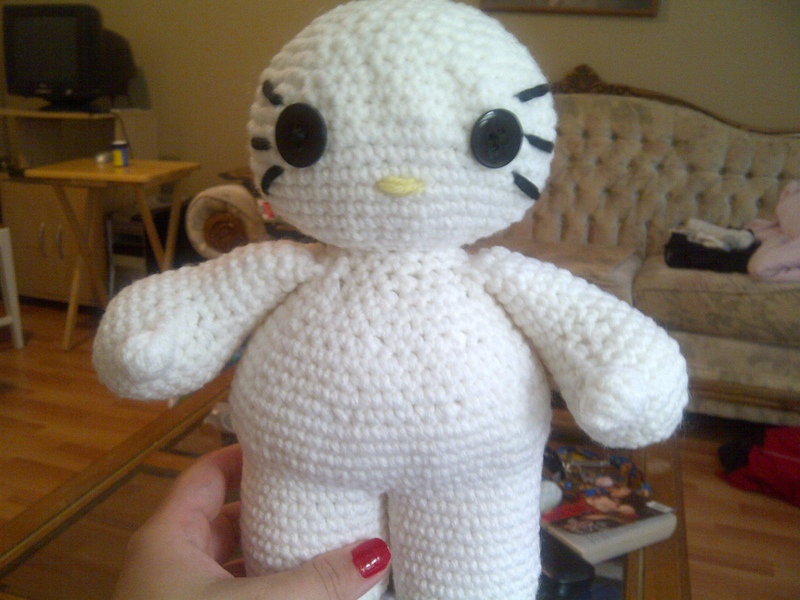 You will need a finished body and finished legs and arms.. all stuffed. What I mean by open is that you haven’t closed it off. Stuff hand firmly, but stuff the arm lightly. 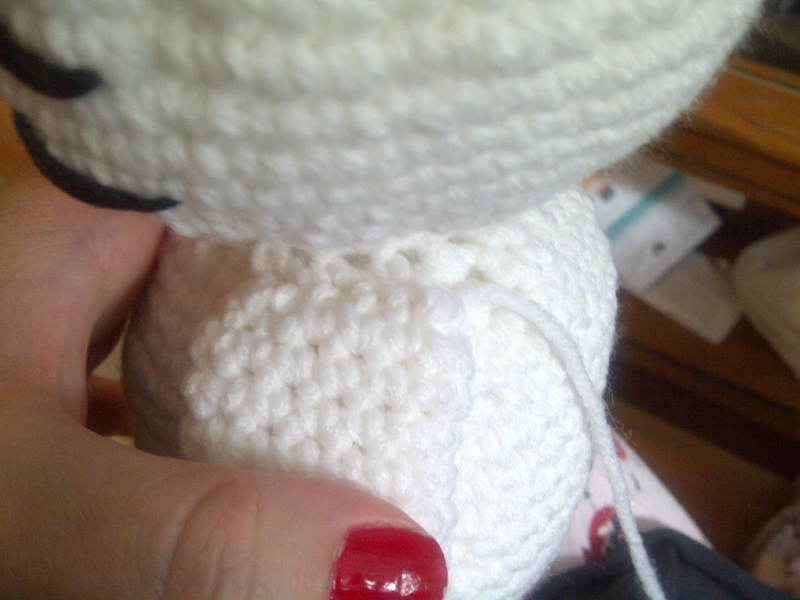 Start with the teddy/dolls left arm. You want to end off so you are at the front side of the arm.. sl st to do that then end off, leaving long tail to sew to body. 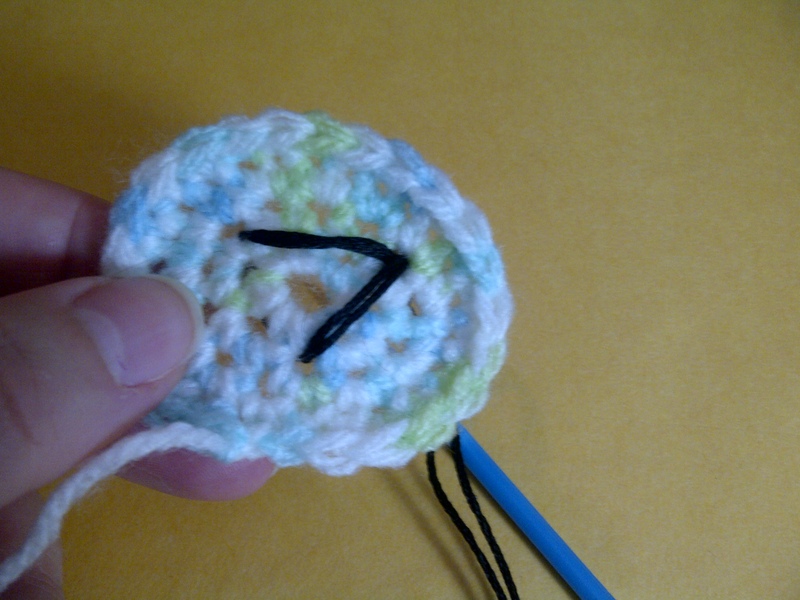 1) Thread yarn through the stitch beside where you ended off on the arm. 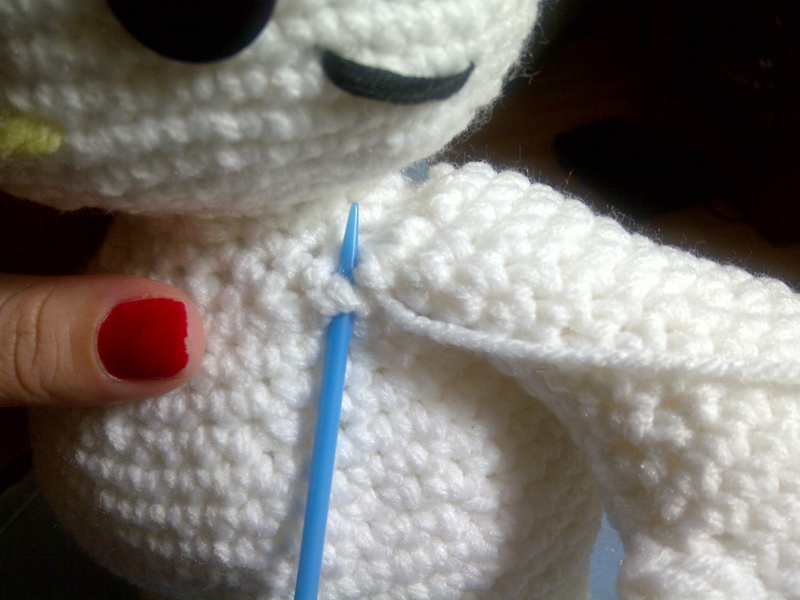 2) Figure out where you want the arm to go and anchor it by pulling needle and thread through the stitch on the body where you want the arm to begin. 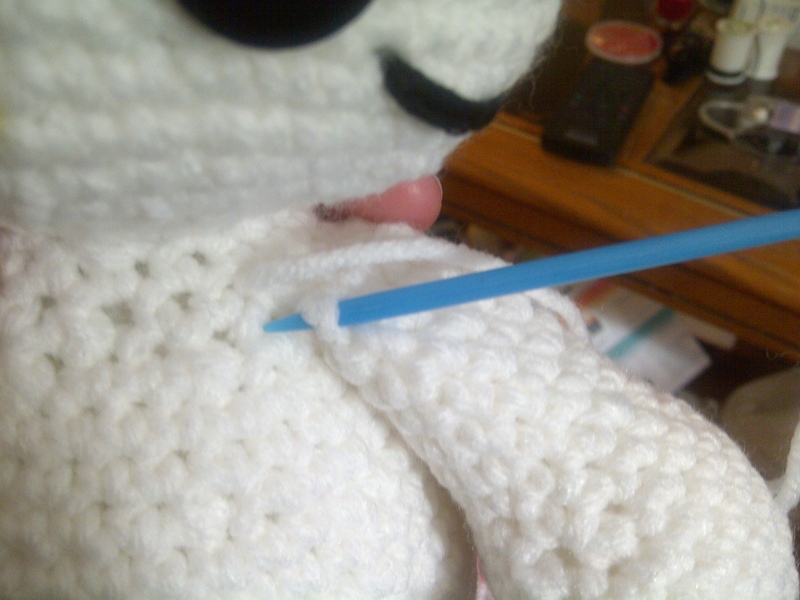 3) Pull needle and thread through next st on arm on both the outside and inside of arm. Only go through the outside loops. 4) Go into next st on the body. Repeat going into sts n arm and body until the arm is attached. 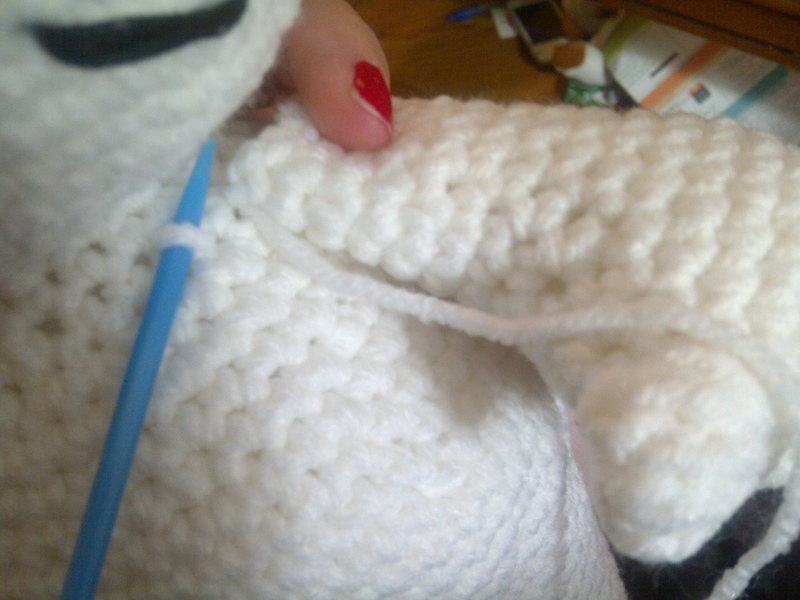 Go into a stitch under the last st you attached arm to and pull through to front of arm. 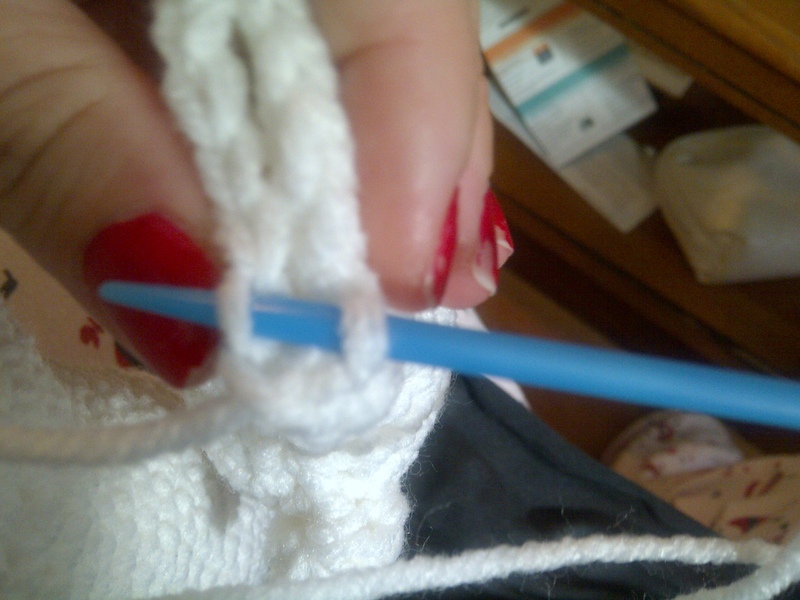 Pull through and knot then pull yarn through under arm and cut off end. Then go back through st on other side beside where you ended off. Finish attaching arm in the same way you did the first. By closed I mean you close the hole up and completely finish off the arm. Stuff and weave in ends and cut off. 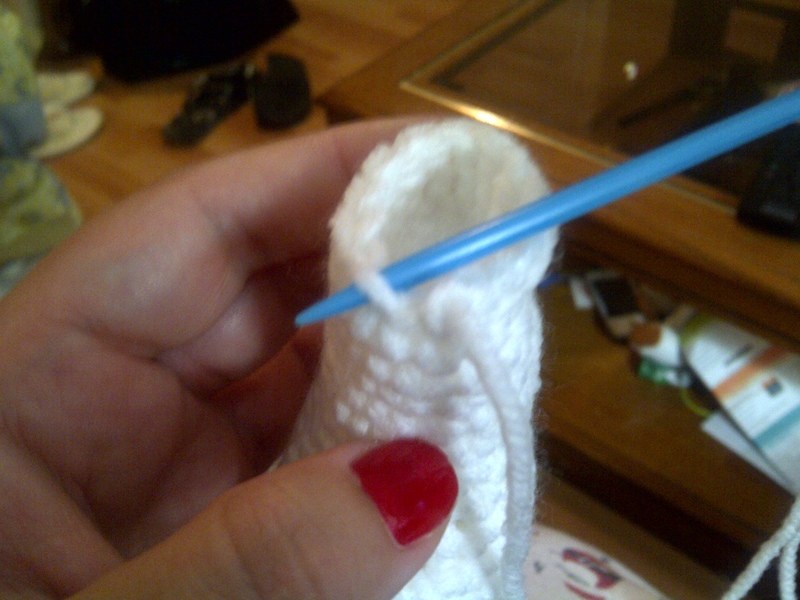 Thread needle with an extra long peice of yarn. 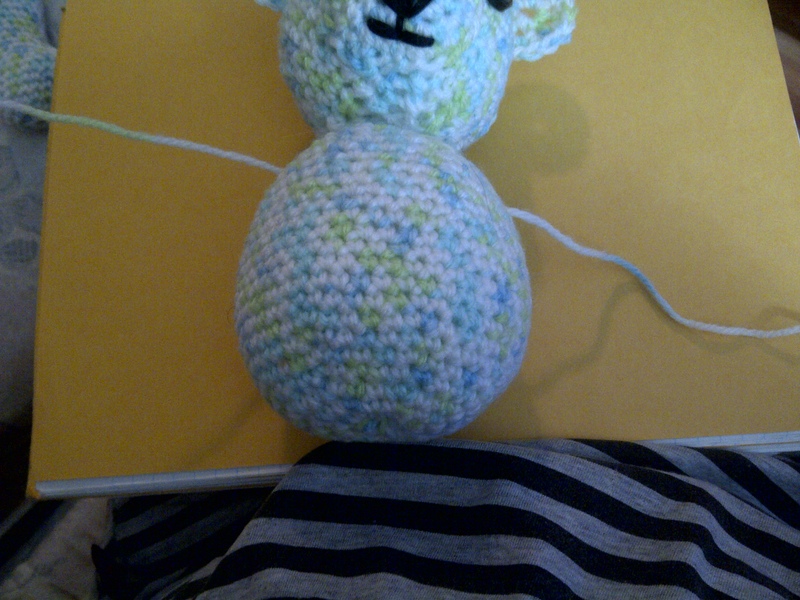 1) Again, start with the teddys left arm. 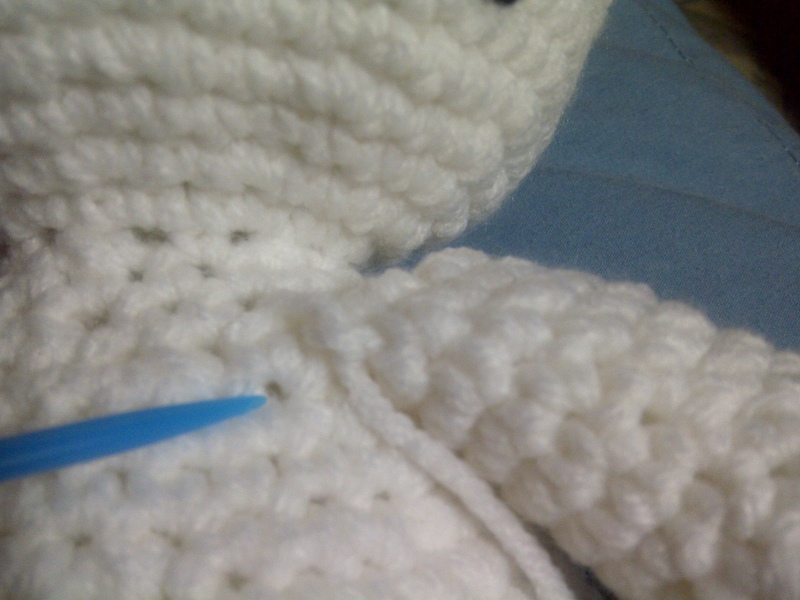 Figure out where you want the arm to go on the body, then go into the stitch below it. 2) Come out on the other side of the body where you want the arm to go.. not below it. Leave a tail where you went into the body. You will use this to tie after. 3) Go into arm, from the inside and go out through the outside. Then go into st beside where you came out from and go back in, outside to inside. 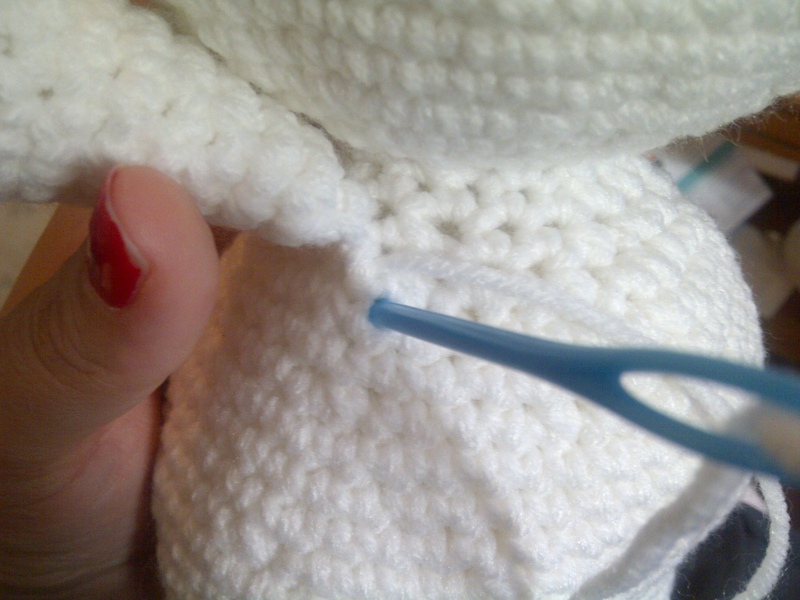 When you pull yarn through, keep it tight and try to push the arm towards the body as you pull or it will get stuck. 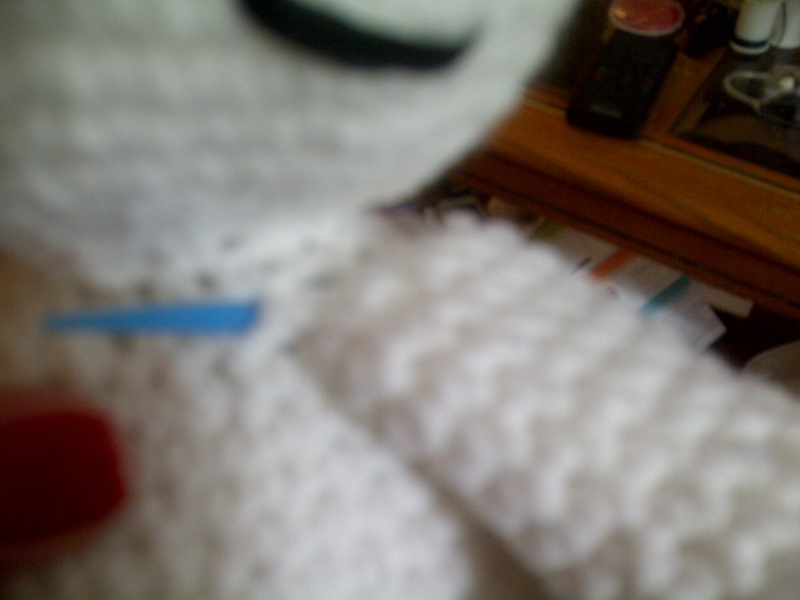 4) Now go onto the stitch beside where you came out of the body. These pics are for legs, for some reason I stopped taking pics while doing the arms and didn’t realize until I had started the legs. As you can see the legs and arms are done the same way lol. 5) Come out on the other side of the body, above where you first went in. Do other arm in the same way you just did the first (steps 3 & 4). Nowgo into the body where you came out and come back out beside the beginning tail. 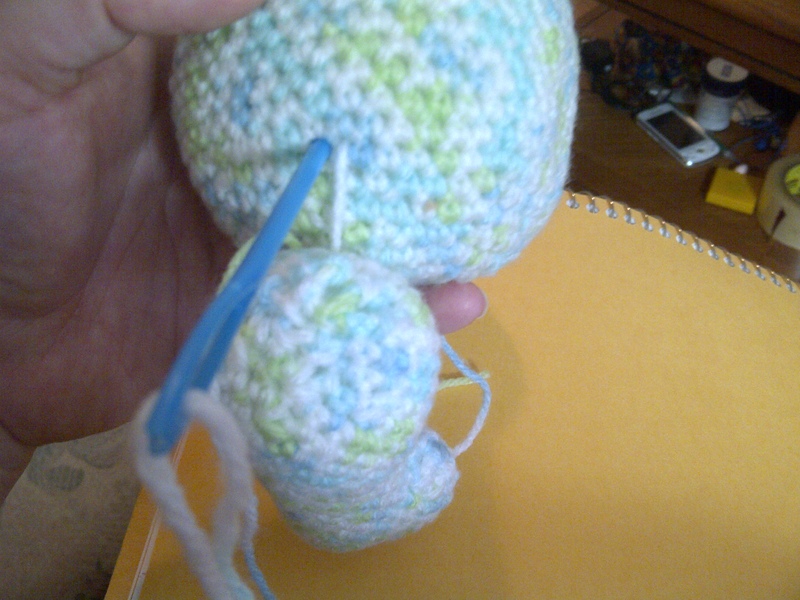 Pull each end so legs are firmly attached but will still move. When you have it as tight as you want it, knot, weave in ends and cut off. 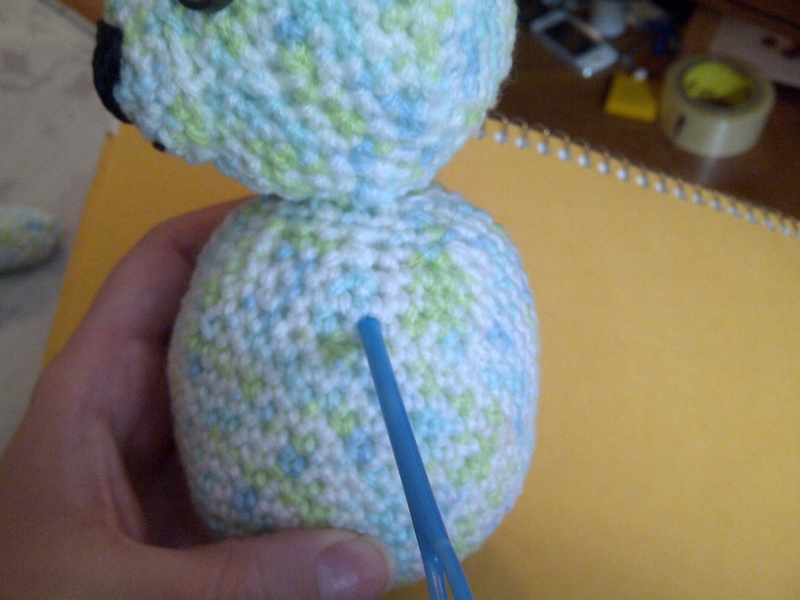 I had someone ask me how I attach the body parts on teddy bears, so here is a quick tutorial. I am going out of town but when I get back I will do a better one, this was just to quickly show anyone who is interested. 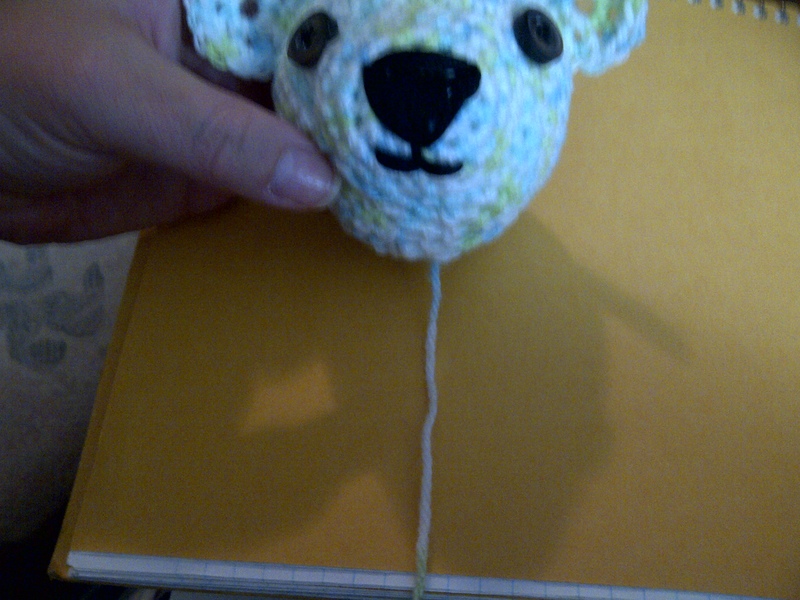 The head is the one part I’m really not that good at lol.. I’m only slightly better at attaching the legs. 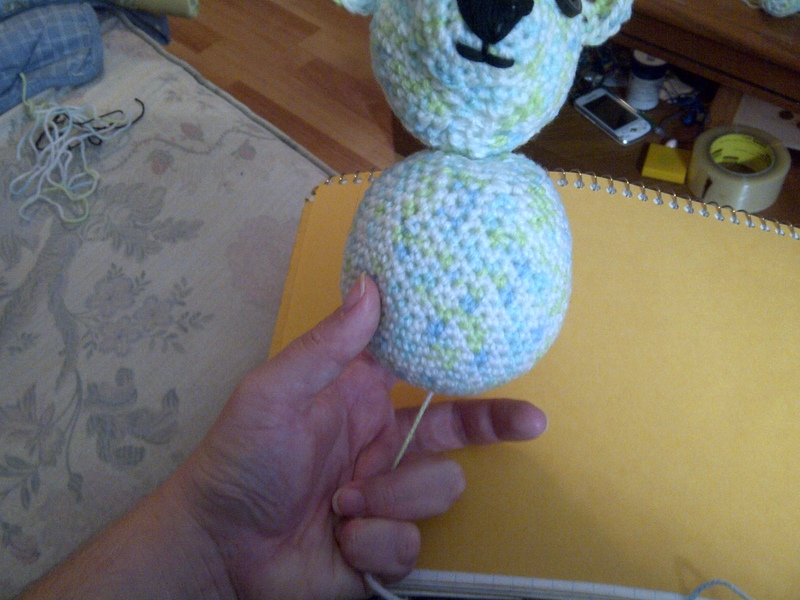 First you need a body and a head, both already finished and stuffed. Weave in the end from the body. After you close up the head leave a very long tail and weave it through the stitches so it is centered.. or as centered as you can get it. 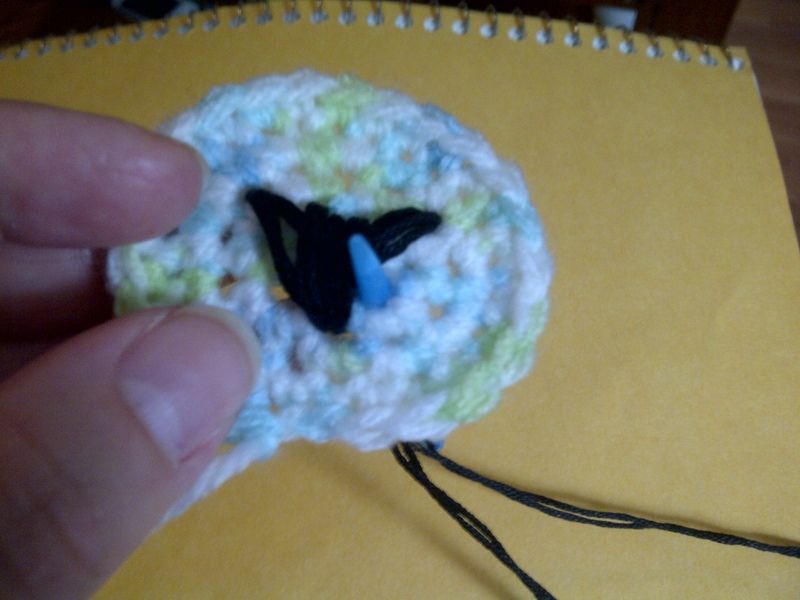 Then push the needle and yarn through the top of the body.. down the centre. 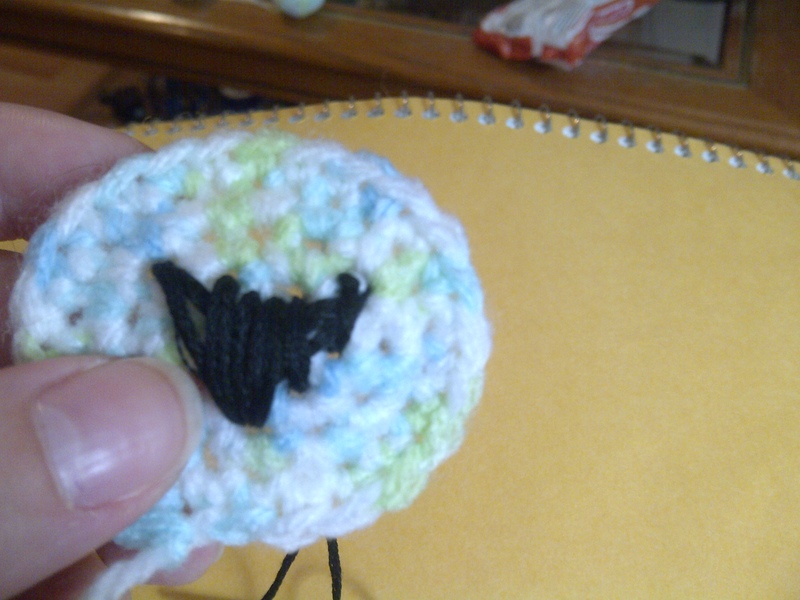 It might be a little hard because of the stuffing but just wiggle it around and it should go through. 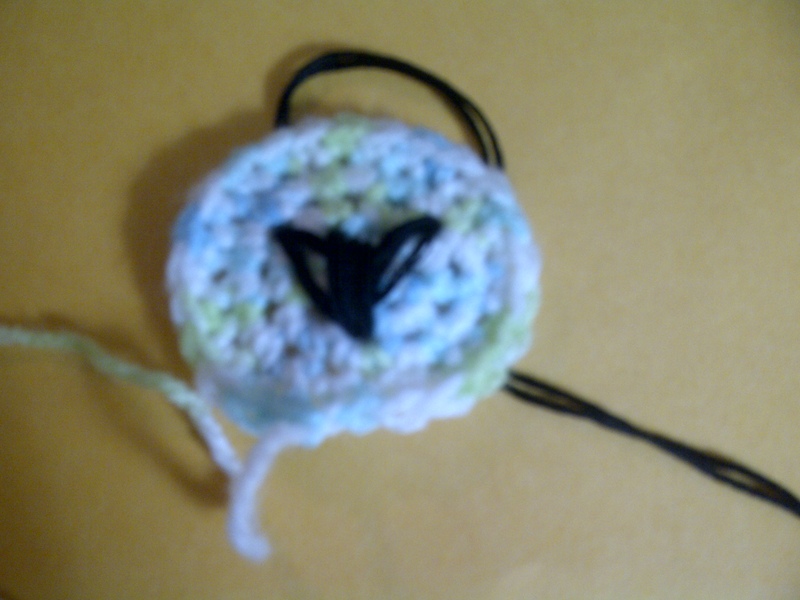 Okay, I don’t have pictures for the next part but it’s pretty simple and when I get a chance I will add pictures. 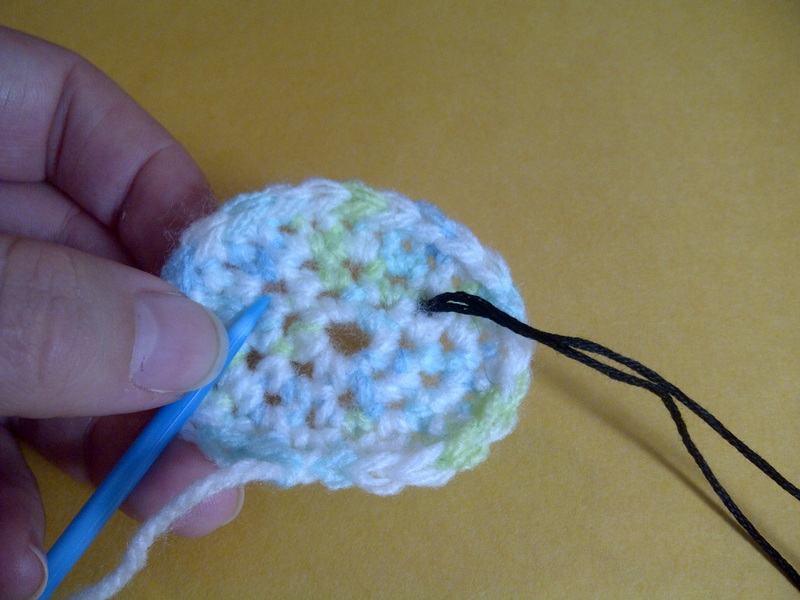 Weave the needle and yarn through a couple stitched at the bottom… Make sure you keep the tension fairly firm on the yarn. This anchors the head so it’s easier to attach. 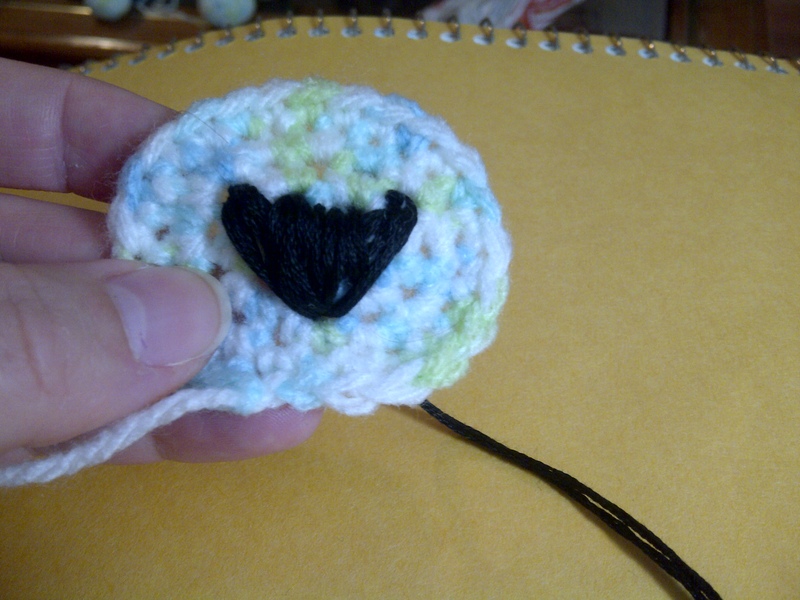 Now we will put a stitch at the front, back and both sides of the head. 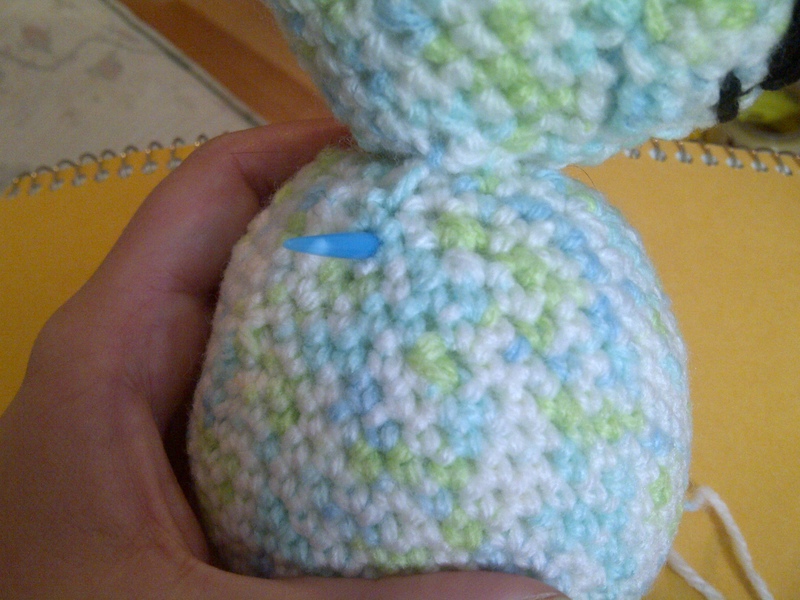 Weave the yarn back up the body and come up at the front of the head. Go through one of the stitches in the head.. I usually go into one that is right at the bottom of the head. 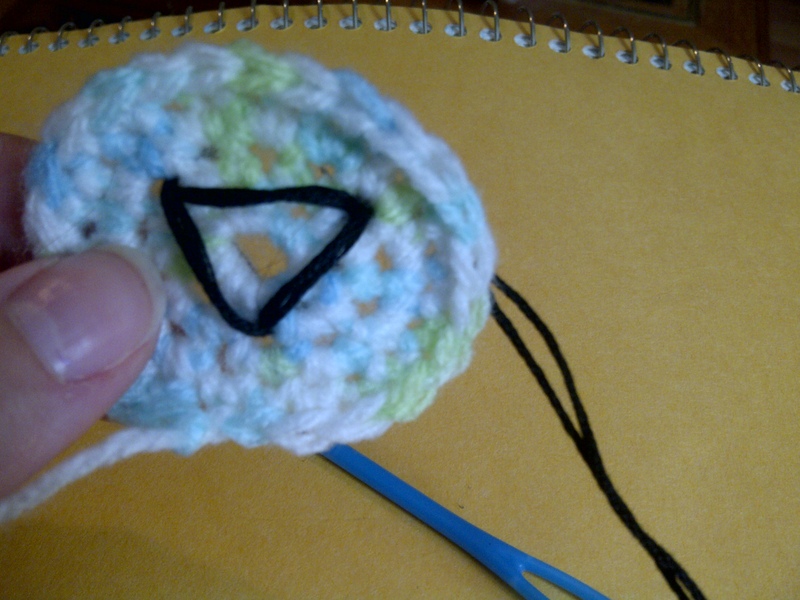 Go back into the body with the needle and yarn and come up at the back and do the same as you did for the front. Do the same for both sides. Knot and weave end and cut off. I have had a few people ask me how I do my noses so I thought I would do a picture tutorial. This is by no means the only or even the best way, but this is how I do it and so far it has worked lol. Also, I’m not the best at always explaining in writing and even though there are pics that should help, if you have any questions don’t be afraid to ask. 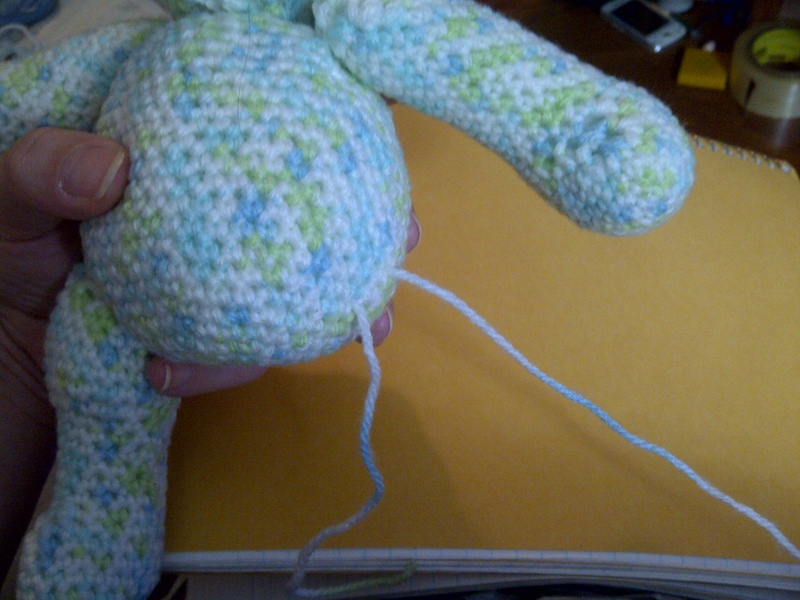 First you will need to make the muzzle… or if you are making a teddy and don’t do the muzzle you can just do this straight on the head. 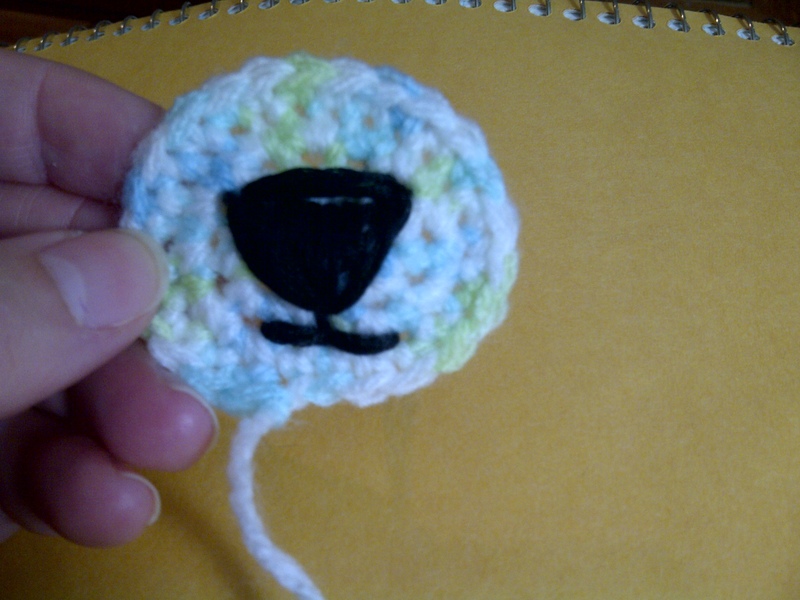 Then you will need a needle that is big enough to thread your embroidery thread through. 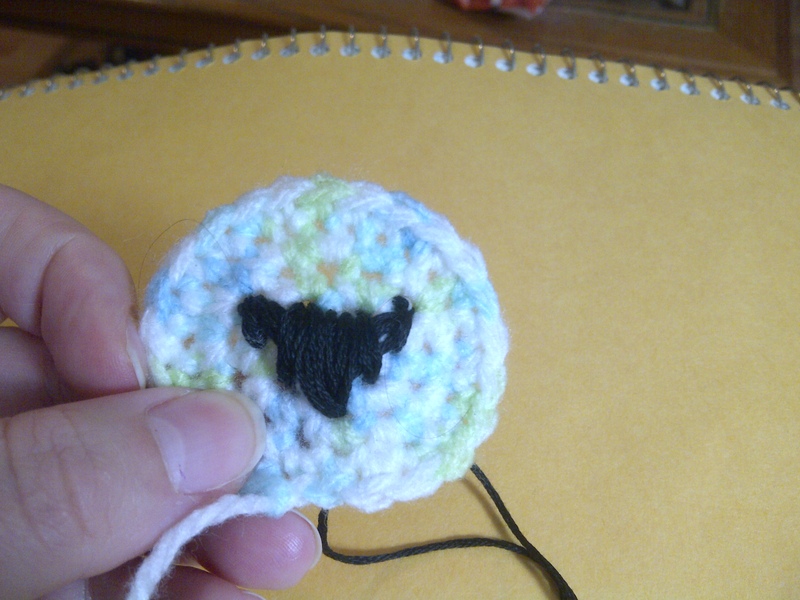 Note: for thread bears I just use sewing thread that I have doubled. 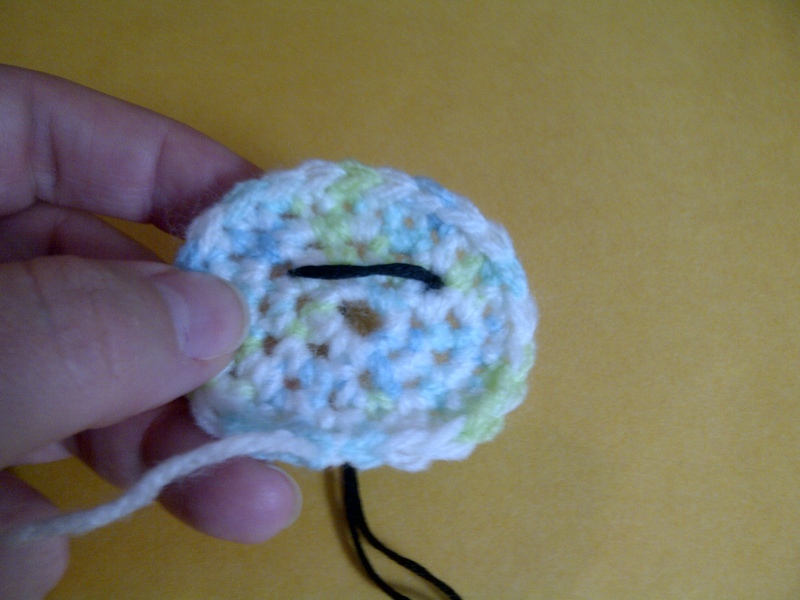 Knot the thread after you have threaded it through the needle head. The thread should be doubled now. 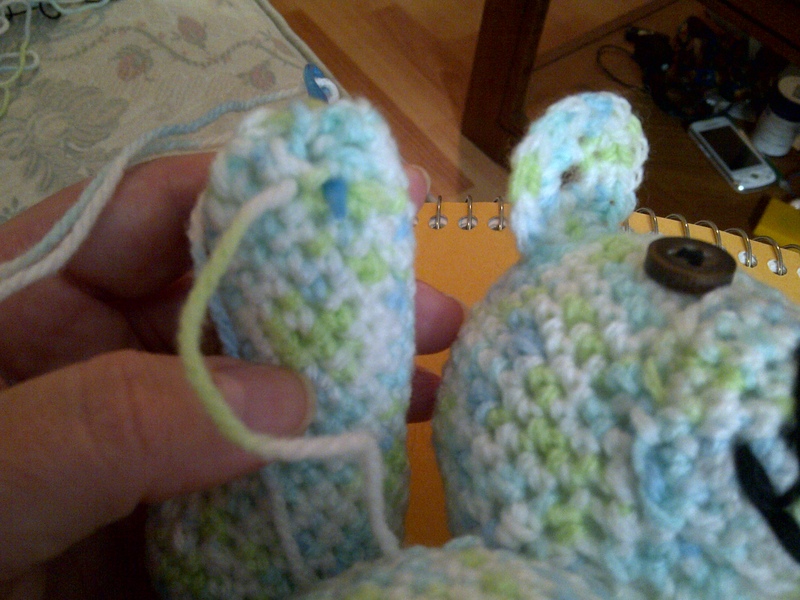 2) Now count four stitch holes across and go into the hole from the front. This forms the top line of the nose. 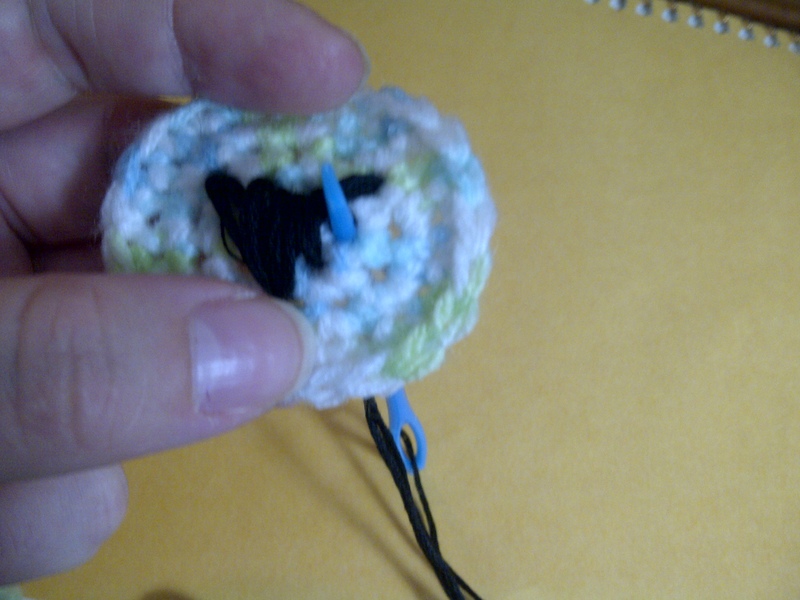 3) Next from the back pull needle and thread through the hole below the big hole… so descriptive I know lol but I have no clue what to call it. 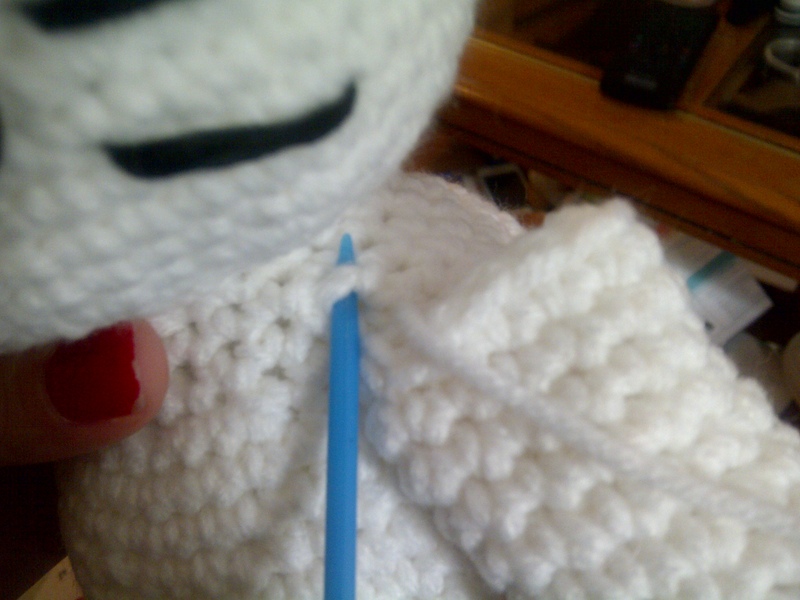 4) Now go into one of the top corner stitches from the front. This forms one of the sides. 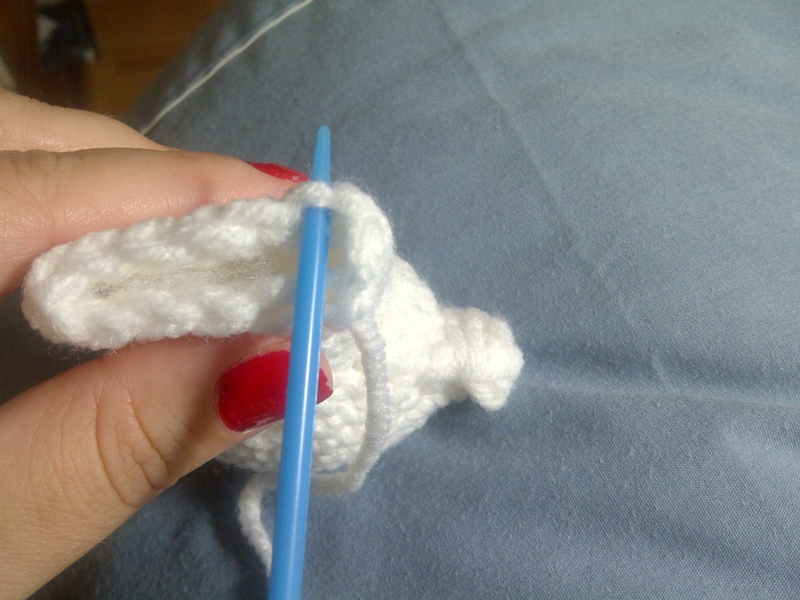 5) Go back into the bottom corner and pull needle and thread through front and go into the other top corner. 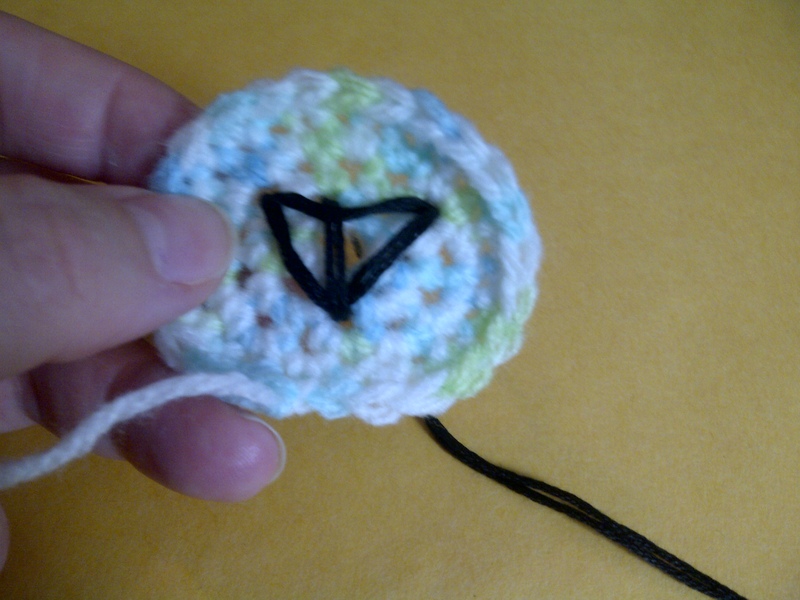 Now you have a triangle. This is pretty much just a guide to follow while you close in the nose. 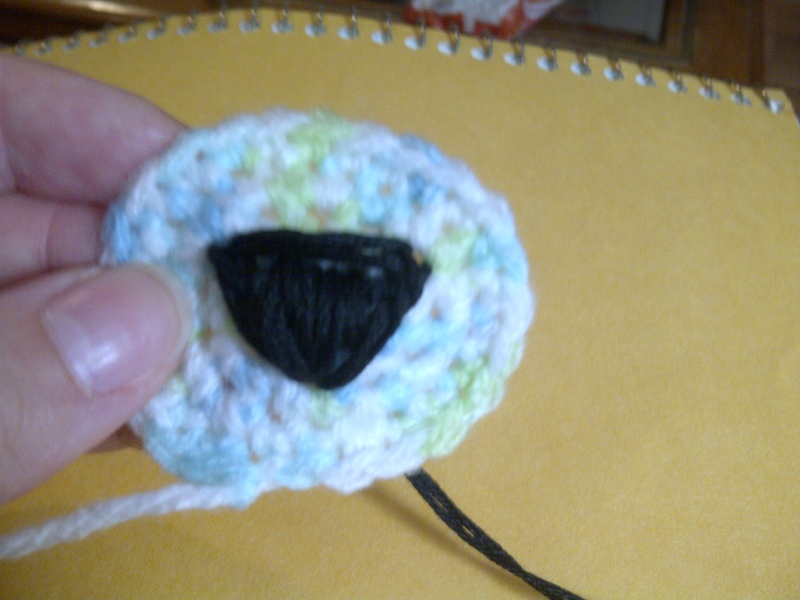 6) Now we need to fill in the nose. Come back up through the bottom corner and go down into the middle of the top line. Work over the original triangle lines you made. 7) We will fill one side at a time. Repeat the above step 2 more times, moving over on the top line slightly. 8 ) Now, come up through the next hole beside the bottom corner and go through beside where you just went through on the top line. 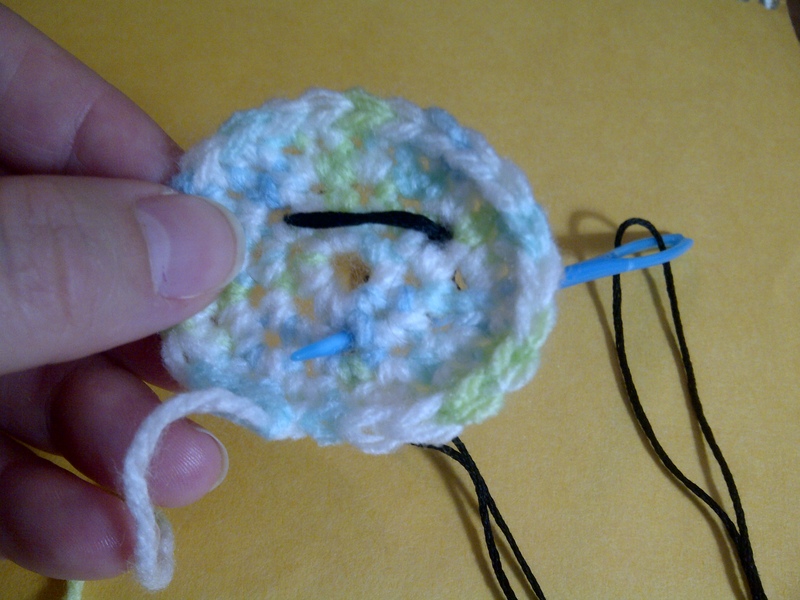 9) Do the same thing but go through the next hole on the side. Now do the other side the same way you did the first side. Come through the bottom corner and go into one of the top corners. This will clean up the side. Do the same for the other side. You can either leave it like this or clean up the top of the nose. Go from one top corner to the other. You’re done the nose. You can add a mouth if you want. Going from the bottom corner I go through one hole down (I do this twice so the line is more visible). Then go 2 holes over on either side (I do twice as well). This is where you can add a bit of an expression by doing one side of the smile longer than the other or only doing one side, doing more of a straight line or even making the lines point down. Note: You might have tiny gaps in the nose.. I usually do… that’s ok. Take a sharpie or felt pen in the colour you did the nose (this is why I usually do black noses lol) and just colour it in.